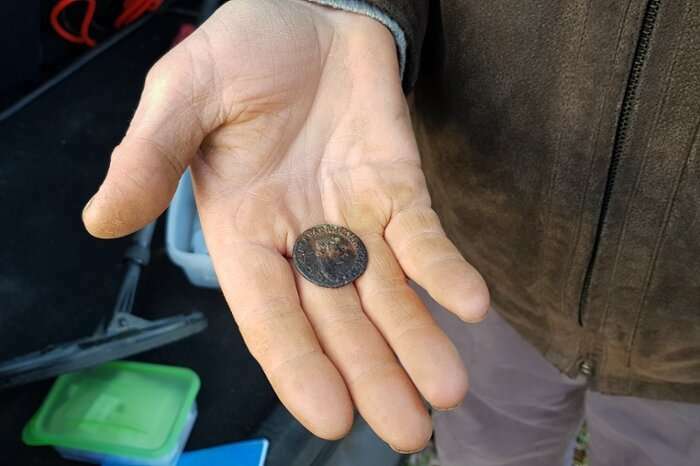 In 2017, in an ordinary field, two brothers from Brabant discovered more than 100 ancient coins. The Leiden historian who examined the coins concluded that they constituted a genuine Roman treasure. Here follows a reconstruction in three acts. 'I'm going to be a bit late.' Nico van Schaijk sounded like he was in a rush when he called his wife in February 2017. There was an edge to his voice. 'Don't expect me home for dinner. It's crazy here.' Then he hung up. His wife had heard enough. The afternoon had actually been rather unsuccessful up to that point. Nico and his brother Wim had been tramping around fields in Berlicum, a village in Brabant not far from Den Bosch, for a good few hours, swinging their metal detectors to and fro in long sweeps over the ground with its light dusting of snow. Left, right, left, right. The cold gradually began to bite through their gloves, and the metal detector was growing heavier by the minute. It would be dark soon. Of course, you always find something during a day's detectoring. An old tin can here, a pot there, or one of the countless shards from wartime grenades and bombs that still litter the ground here. But those bits and pieces are not why the brothers do it, if only because the boot of their car is already full of that stuff. That day, as Wim would later recall, all they found was 'rubbish'. They could only see one silver lining: at least they hadn't found any unexploded grenades. If they had, they'd have had to call the bomb disposal experts in to blow the thing up, and that would be the end of any more detectoring. It was Nico's metal detector that came across it first, causing a piercing, high-pitched sound to echo across the snowy Brabant landscape. Wim's machine went off next, and then again, and again. After a while the detectors were shrieking so often and so shrilly that Wim wondered if there was something wrong with his device, but no: there really was a signal coming from the ground. The brothers started digging like beings possessed. 'Yes,' thought historian Liesbeth Claes of Leiden University. Although she browses internet forums fairly regularly, she had never seen anything like this: two brothers claiming to have found a large quantity of Roman coins. And in Berlicum, of all places, a Brabant village far from the big rivers, and hence far from the borders of the Roman Empire. What were the coins doing there? And was it really treasure? A specialist in Roman coins, Claes was keen to look into it, so she got in touch with Nico and Wim. In the meantime the brothers had reported their find to PAN (Portable Antiquities of the Netherlands), and the National Cultural Heritage Agency (Rijksdienst voor het Cultureel Erfgoed, RCE) had decided to conduct archaeological research. She soon received photographs showing four silver denarii and 103 other coins, mainly bronze sestertii and asses. Current scholarship has shown that the coins were minted between the reigns of emperors Vespasianus (69 CE) and Marcus Aurelius (180 CE). The find also contains one older coin by mint master Calpurnius (90 BCE). After all that time lying in a sandy stratum in a wetland area that contains a lot of naturally-occurring iron, many of the coins had developed a thick iron crust. At first it didn't look as if this was really a treasure, as the coins weren't found at a single site, but were spread out over a larger geographical location. In archaeologist-speak: it's not a hoard. That means it's extremely unlikely that a rich Roman citizen buried an amphora of coins in the ground. Moreover, not all the coins date to a single emperor's reign, suggesting that these coins were put into the ground over a longer period. However, Claes later concluded that it is very likely to be a treasure after all, of the type known as a votive treasure. Several different people probably left coins at this specific place over a longer period. This is quite possible, as RCE research has shown that in Roman times the site of the find was a fordable point in the Aa. Could the coins have been an offering to the gods to ensure a safe crossing? Claes explains that the find is special on its own merits: it clearly shows that Roman life in the Netherlands was not limited to the fortifications along the Rhine and Waal rivers. There was also activity further inland. 'And who knows? Maybe the crossing at Berlicum was a key stopover between the various important Roman towns in the area, such as the temple dedicated to Hercules Magusanus in Empel, the pottery in Halder and the settlement at Cuijk,' Claes suggests. Back in Berlicum, the brothers share rueful smiles. They're aware that the find is not the key to their early retirement – just getting the coins cleaned probably cost more than they would fetch on the open market. So Wim is heading back to his security firm, and Nico is returning to his cows. The person who pumps out the manure from under the floor of the stalls is on his way, so Nico has to get going. What remains is the story: the story of two brothers from Brabant whose ordinary metal detectors revealed a complete Roman treasure. The media descended on the story in no time. From the local paper to the national news, from the regional Brabants Dagblad newspaper to TV channel SBS6: Nico and Wim have patiently shown the journalists around 'their' field by the winding river Aa. They've become used to being photographed, spade and metal detector in hand. 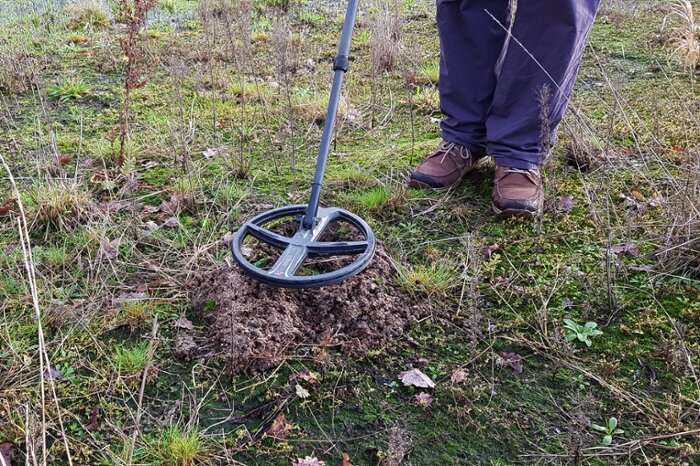 It's been a crazy time for these two amateur metal detectorists. We leave the field. When we get to the car, Nico puts his metal detector away, closes the boot and gets behind the wheel. The dashboard is covered in a fine layer of grime, and there are muddy footprints on the carpet: this car clearly belongs to an outdoors person. Nico starts the engine, slowly releases the clutch and drives away along the sandy lane. Tonight, he'll be eating at home.